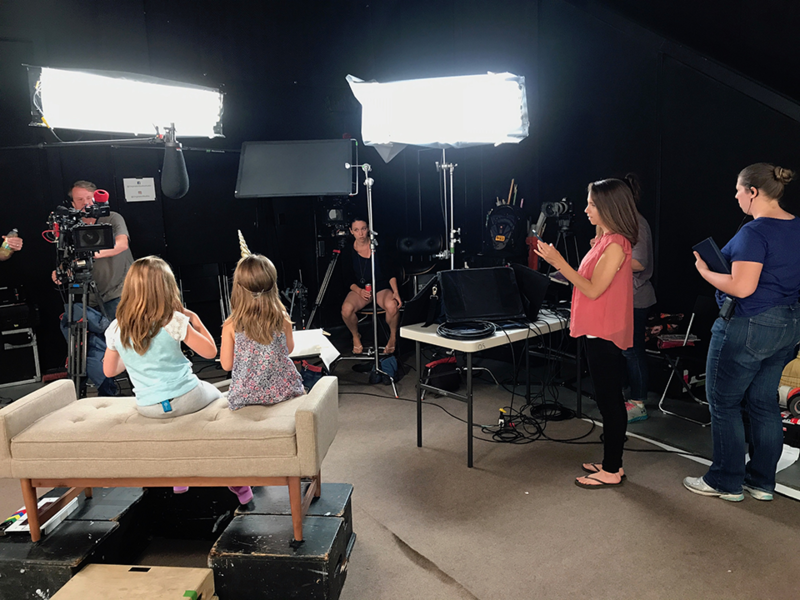 A behind-the-scenes photo from the A&E special Deaf Out Loud features CSUN alumni Sheena McFeely and her husband Manny Johnson, with their daughters, Ivy and Shaylee. Photo courtesy of Sheena McFeely. 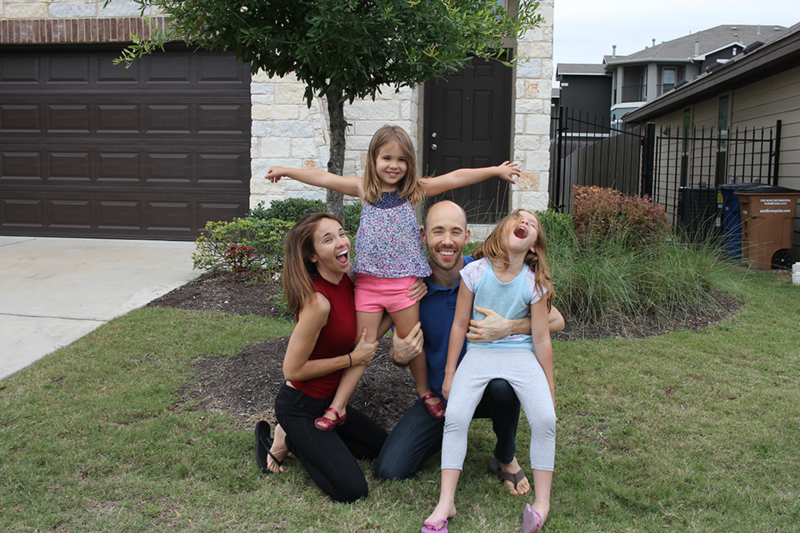 CSUN alumni Sheena McFeely and her husband, Manny Johnson, and their daughters, Shaylee and Ivy, pose in front of their Texas home for the A&E documentary Deaf Out Loud. Photo courtesy of Sheena McFeely. California State University, Northridge alumna Sheena McFeely ’08 (Journalism, Communication Studies and Deaf Studies) and her husband, Manny Johnson ’04 (Marketing), are changing the way Deaf and hard-of-hearing people are perceived in the media. They are both Deaf and are sharing their story about raising a family with one Deaf and one hearing child, in the A&E documentary one-hour special Deaf Out Loud. Their eldest daughter, Shaylee, is Deaf. Younger daughter Ivy is hearing. McFeely and Johnson use American Sign Language (ASL) to communicate with both children. Deaf Out Loud is set to premiere at 8 p.m. on Sept. 12 on the A&E Network. 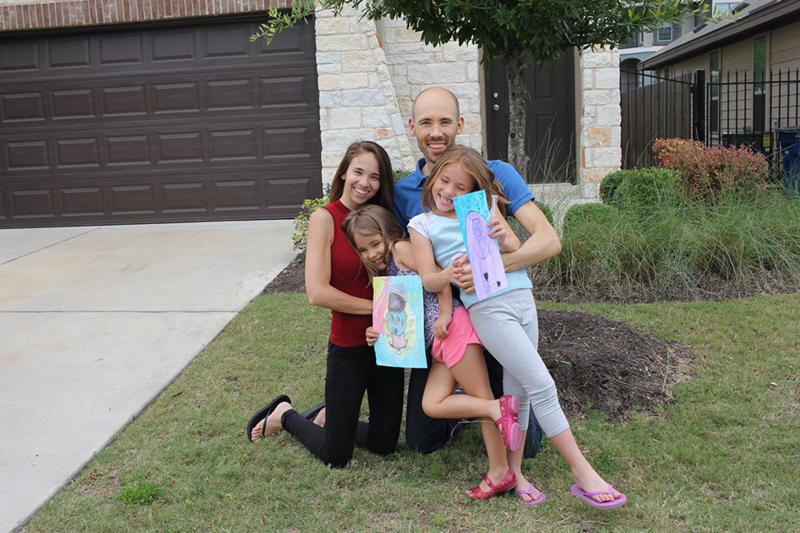 The special follows three predominantly Deaf families as they raise their children in a hearing world. With many differing opinions in society about how Deaf children should be raised, the families work to forge their own paths forward and combat the daily social stigmas faced by many Deaf people. McFeely, Johnson and their daughters said they want to show why it’s important for Deaf families to be fairly represented in the media — something they’ve been doing for years. McFeely and Johnson gained national attention with their online educational video hub, launched in 2013 on their YouTube page and the website ASL Nook. The hub offers lessons in ASL. McFeely has made several media appearances, writes books, produces and directs her own content, and serves as a motivational speaker. Her YouTube videos have received millions of views. McFeely said the family jumped at the chance to take part in the documentary nearly two years ago. McFeely emigrated from Hong Kong to the United States when she was a child. When she was in elementary school, her family moved to California. At 10 years old, she attended a program called TRIPOD in Southern California, where she learned ASL. Years later, as a new undergraduate student at CSUN, she met Johnson at a new student orientation. Initially, the two did not get along, but by the end of orientation week, something tragic happened to a friend of McFeely’s that softened Johnson’s opinion enough to ask her to lunch the following week. “It was the longest lunch of our lives,” they quipped in their email interview. When the couple reflects on their time at CSUN, they said the university shaped the way each of them moved forward in society. Johnson grew up in Georgia and came to CSUN through an exchange program from the University of Georgia. He then transferred to the university as a marketing major. He had a lifelong fascination with entrepreneurship and business, which led to a passion for supporting Deaf-owned businesses. He served as president of the CSUN National Center On Deafness (NCOD) Alumni Chapter, where he introduced an e-newsletter, presented a successful Career Day and hosted reunions and other gatherings. Johnson said he doubled the number of annual members and tripled the number of lifetime members. McFeely said CSUN opened her eyes to how the world perceives Deaf people in the film industry. At first, she majored in Cinema and Television Arts (CTVA), hoping to become an actress and screenwriter. After a while, she said, she felt out of place pursuing that field. Johnson said CSUN opened his eyes to new possibilities. “Growing up Deaf in a mainstreamed world, I was ignorantly content with blending in, in the hearing world,” he said. “The exchange program at University of Georgia brought me to CSUN, which opened so many doors that I never knew were closed. CSUN had about 150 Deaf students — that opened my eyes to what I was missing out on in my life: the instant and free-flowing communication as well as deep, intellectual conversations.